The chemical peeling opens very individual treatment possibilities by the variety and above all by the different intensities. The professional application of a medical peeling is the alpha and omega of a successful treatment. From skin cleansing to complete skin renewal – peelings are able to support and optimise the physiology of the skin. Daily skin care is one of her options as well as the targeted correction of age changes and disease states. A good basic knowledge of the function of the skin and the well-known and proven application possibilities of the various peeling methods are a prerequisite for this. One of the superficial peelings is the fruit acid peeling, which consists mainly of alpha hydroxy acids (AHA). The most common bases of these acids come from sugar cane, milk, apples, citrus fruits and grapes. 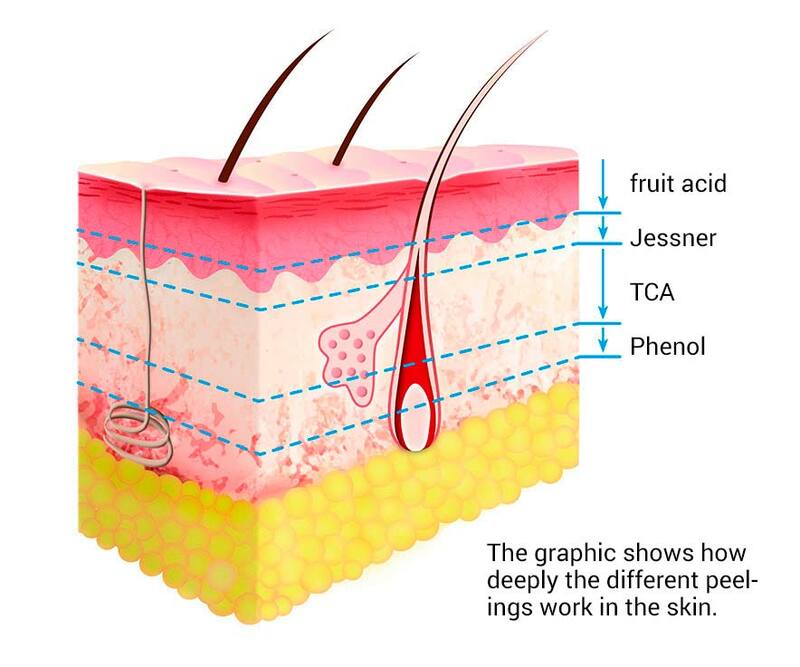 In contrast to the deeper chemical peelings, a fruit acid peeling only has a superficial effect on the skin. At higher concentrations and small molecule sizes, they additionally stimulate the connective tissue synthesis in the depth of the epidermis. Among the medium-depth chemical peels is the classic TCA peeling or trichloroacetic peel and the so-called BluePeel after OBAGI (based on trichloroacetic acid). Both are a chemical peel capable of smoothing fine lines or superficial scars, correcting skin pigmentation and reducing sun-related cell damage. The medium deep peeling can be ideally combined with a deep peeling. While all other peels are limited to a renewal and optimisation of the skin surface, deep peels or phenol peels cause a pronounced stimulation of tissue synthesis even in the deep layers of the skin and lead to a marked rejuvenation via the stimulation of collagen and elastin production – not only in terms of the aesthetic effect of the skin, but also in terms of its mechanical properties. It comes to a complete skin renewal. With a peeling treatment alone, it is often not possible to effectively and persistently improve the appearance and function of the skin. In order to achieve a truly lasting effect, a treatment plan tailored to each patient’s situation is necessary. The starting point for this must always be a comprehensive and individual analysis of the actual condition of the skin. Only in this way can a suitable plan be developed to optimise the skin and ensure its long-term preservation. As a rule, there is a whole bundle of measures that come to fruition in a recurrent sequence and can finally be repeated like a cycle. There are also methods of Dermabrasion, Needling and laser treatment.